Invite friends and family to your home after transforming your yard with outdoor lighting, mosquito mist and sound systems from Mirage Outdoor Lighting in Houston/Cypress, Texas. 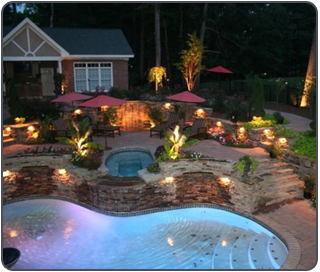 Mirage Outdoor Lighting provides personalized lighting designs to match your outdoor home design. Mount lights in your trees, accent your flower beds with moonlight effects, and create silhouettes for your house and fences with our energy efficient LED lighting system. We will come to your home to estimate the capacity of your land area, provide a project proposal and give you an overview of what your future lighting design will look like. Protect your family with fully automated and maintenance free mosquito mist systems that kills mosquitoes, spiders, flies, ticks, fleas, and roaches. Our mosquito mist system is effective, safe to use, and affordable. 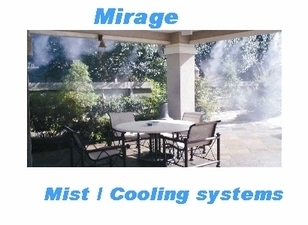 Give your patio a relaxing mist and cooling effect with a personalized high-pressure cooling system designed to fit the perimeter of your patio. With our mist/cooling systems, you can enjoy the outdoors even in the middle of the summer. Transform your backyard design with our personalized outdoor sound system. We provide patio, landscape, and rock speakers specially designed for outdoor use. Our speakers feature a unique outdoor volume control to let you adjust the sound volume without having to go inside your home. What are the benefits of the Mosquito Mist Away System? The Mosquito Mist Away System effectively eliminates mosquitoes and other biting insects from your yard. It is fully automated and maintenance free. It provides protection from insects for your family and pets. Is the Mosquito Mist Away System easy to operate? Yes, all you do is set the timer, and at the designated time, a light mist is released into the air eliminating bothersome mosquitoes and biting insects. A fully automated timer combines reliability with ease-of-use. You simply set the timer, and at the designated time, a light mist is released into the air, eliminating bothersome mosquitoes and other biting insects. You will never have to purchase or spray harmful chemicals around your family or pets again. Pyrethrum is an insecticide extracted from Chrysanthemum flowers. It has low toxicity. It is completely safe and it is EPA approved, water based and biodegradable. It never leaves a residue. Choose a combination of these different types of speakers: rock, patio, and landscape speakers. We will install an outdoor volume control for convenient adjustment of the volume. Contact us at (832) 534-2850 for more information about our outdoor lighting and sound system.